Were Suicide Squad’s Trailers Misleading? With the dust settling from the release of the highly talked, box-office success Suicide Squad, the reactions to the films have been…interesting. Critically savaged, the box-office success has been record breaking although the fall within the three day week suggest it might not have legs. Yet fandom has been passionately supporting the movie. All this despite Suicide Squad originally not being conceived as a tent pole superhero movie at all. It was supposed to be the antithesis of such things, the refreshing alternative. It was supposed to exist alongside risky properties like Deadpool, Ant-Man, or Doctor Strange…not The Avengers or X–Men. But in 2015, all that changed and Suicide Squad became a movie DC couldn’t just take a risk with but the movie they’d depend on. The “Bohemian Rhapsody” trailer and comic-con version couldn’t be less alike. Comic-con’s trailer (based mostly on footage conceived by David Ayer before they began re-shooting and re-editing the film) promised a slow, almost 40s-esque film noir about antiheroes with deep problems and tortured pasts manipulated by an even more contemptible person with power into doing things even worse than they’d ever done before. The “Bohemian Rhapsody” trailer promised something cartoonish and outright comedic, without any of the emotional core of the first. Rather than introduce the trailer with Amanda Waller’s deep-dark plan, the way her speech is cut down to just a few sly remarks significantly lightens her plans into something of a joke. The characters are no longer “victims” of circumstance but they are also not evil, just criminal misfits with snarky lines.Then cue the music.With lyrics like “no escape from reality” the imagery presented takes on a much lighter tone with the trailer playing more like those early teasers for Guardian of the Galaxy than something within the dark Batman universe comic-con first promised. That tagline says a lot about the movie that arguably, the studio shouldn’t have every put out there. The initial promise was that antiheroes (or villains) that were bad, would be forced to do worse things because powers that be control them. That idea was lost in this second trailer and instead, they were presented as anarchic, misfit HEROES of the Guardians of the Galaxy variety. Even the suggestion of these characters being heroes changes the message of what this movie will be significantly. Heroes are characters to be admired, liked, redeemed and related to. It would be hard to argue that DC or Ayer would want the Suicide Squad to be such a thing. And by the time this trailer his theaters, the PG-13 rating was clearly the goal, which means heroes couldn’t even be used satirically, because the movie was meant to appeal to younger audiences as well. Perhaps realizing that both the “Bohemian Rhapsody” and Comic-con trailer using “I Told a Joke” said things which were very different from what they wanted (or were going to deliver), DC seemed to split the difference with their April (right on the tail of Batman V. Superman) with the “Ballroom Blitz” trailer. The more artistically geared trailer then changes to something more up-tempo and chaotic action is back, cutting to “Ballroom Blitz” once again with far more one liners from all the characters, but primarily showcasing Harley Quinn (and showing a certain similarity to Deadpool’s one-liners). Quinn in fact dominates this part of the trailer (as if the ringleader of the chaos) until they cut in The Joker’s laugh and Harley’s cut to reaction suggests he’s an unwelcome presence in this free for all. Almost as if Joker’s the villain they’ll in fact be facing. The trailer is clearly split into two very different tones, styles, and paces and considering the film which ultimately came out last week, seemed to intentionally hint at what the film aimed to be. The movie has a chaotic sense of humor in parts but it rarely intersects with the political aspects in Waller’s world. What is inaccurate in this trailer is the promise of the squad becoming a team. Almost all the shots of the team really interacting in a meaningful way in the film are used in the trailer. In reality, their interpersonal connection barely exists. Regardless, the “Ballroom Blitz” trailer came closest to delivering the best of what the film could have possibly delivered, even though it didn’t showcase how truly hodgepodge the film would be. Even now, the statement sounds profound but is edited in such a way that it makes no sense. The trailer is poorly edited. The images selected over the song “Heathens” and dialogue are almost meant to strike memories of those previous, highly praised trailers that caught everyone’s attention. Harley on the swing, Deadshot looking into the sun awaiting the guards’ attack, Jai Courtney’s Boomerang screaming; it all happens too quickly to convey or interpret any information unless you’ve seen those other three trailers. The next choice to cut to the clip from Batman V. Superman further stresses the idea that Suicide Squad isn’t the outcast film in the DC universe, it’s the next step to building the extended universe. Amanda Waller’s speech is cut this time over massive CGI spectacle, which resulted in a multitude of complaints from excited fans suggest the movie might not look great. Flag and Waller are there specifically to provide exposition commentary, rather than a suggestion of their characters. Unlike the “Bohemian Rhapsody” trailer that showed an exhausted Flag, his speech now has the ring of being a boring military operative which makes Deadshot’s triangle of trust joke seem less motivated and simply a forced laugh. In fact, the entire trailer suggests lines which rarely seem character specific and have the unbearable feeling of feeling like late additions. Particularly a number of Will Smith and Jai Courtney’s lines. The editing is quicker and less choreographed to the trailer’s musical selections than any of the previous trailers and the musical selections (now three new songs) seem haphazardly selected from the soundtrack to raise the songs’ awareness, rather than to convey an emotion or reaction audiences have to more familiar music. The entire presentation has the strange feeling of selecting the biggest, loudest scenes from the three previous trailers, but editing them without logic or desire to create a sense of tone they want audiences to anticipate when they finally go to see the movie. Even the new tagline the trailer was given, “Thank squad the wait is almost over” feels shockingly uninspired. It has nothing to say regarding either the characters or tone of the film. It essentially teases and promises nothing except a big, load chaotic mess of a movie that will offer more eye candy than story, more characters than can be contained in a single movie. Which is ultimately exactly the movie we got. We wanted a film closer to any of three previous trailers that made an impression and essentially sold the film. But all those trailers were so artfully made, they over sold a film which turned out to be an unfocused, uninspired mess that pulled from just about everything, but never took stock and focused; just like this baffling 2016 comic-con trailer. The sad fact is, while the fourth and final trailer disappointed those blown away by the promise of the first three marketing masterpieces, that disappointing mess didn’t misrepresent the movie it was selling the way those other three did. 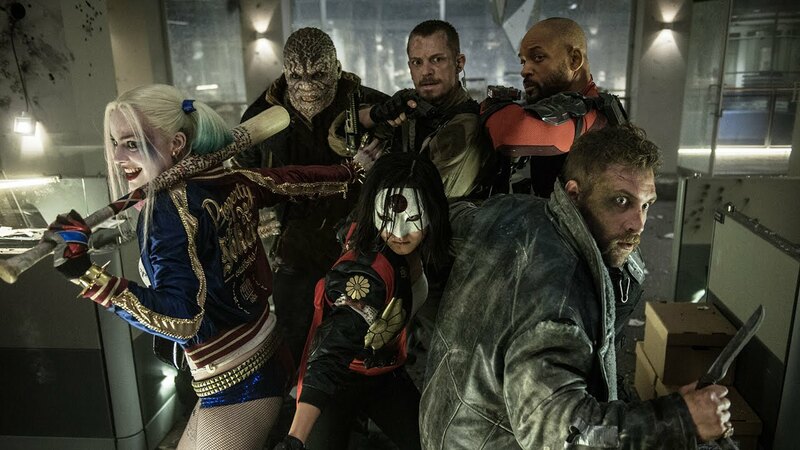 Suicide Squad was just as disappointing a mess as that last trailer. Lesley Coffin is editor and founder of Movies, Film, Cinema. A writer with a masters degree from NYU’s Gallatin School in biographical studies and star theory. She wrote the biography on Lew Ayres (Lew Ayres: Hollywood’s Conscientious Objector) and Hitchcock’s Casting (Hitchcock’s Stars). Lesley currently freelances for a number of sites, including regular contributions to The Interrobang, Pink Pen, The Young Folks, and previously wrote for The Mary Sue and Filmoria.